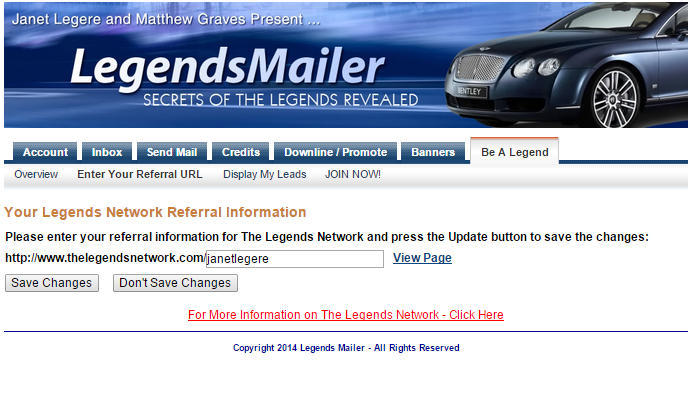 Janet Legere & Matthew Graves have teamed up to present a Mailer with a unique twist! A Marketing System like no other! 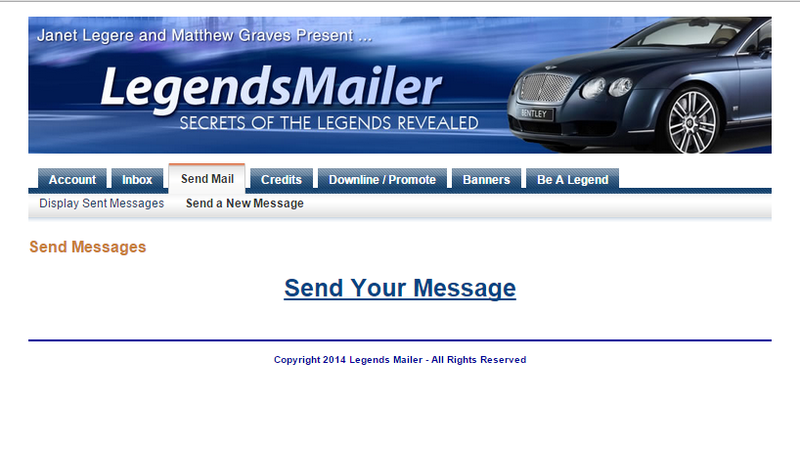 I am excited to take you on a pictorial journey of Legends Mailer. 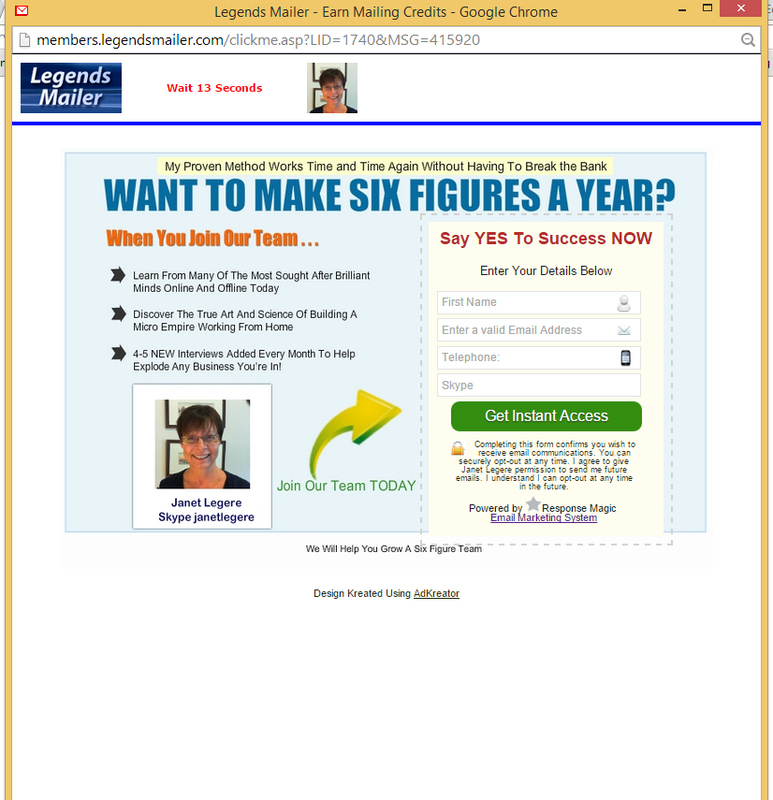 It’s free to join and I highly recommend the one time offer for an annual subscription. It has the BEST value. You can also purchase unlimited credits! 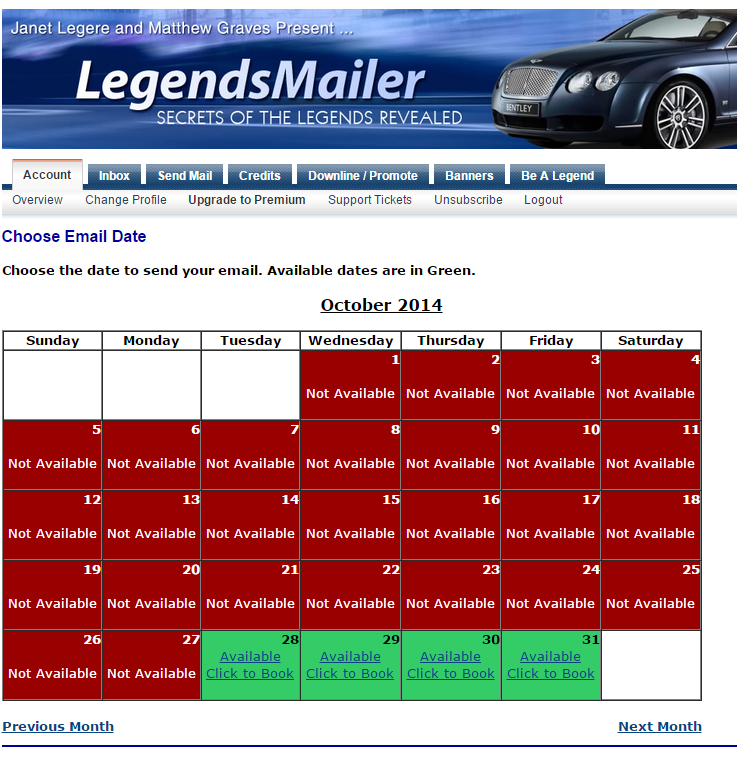 Once registered, you will login to the members’ area to access this amazing system. 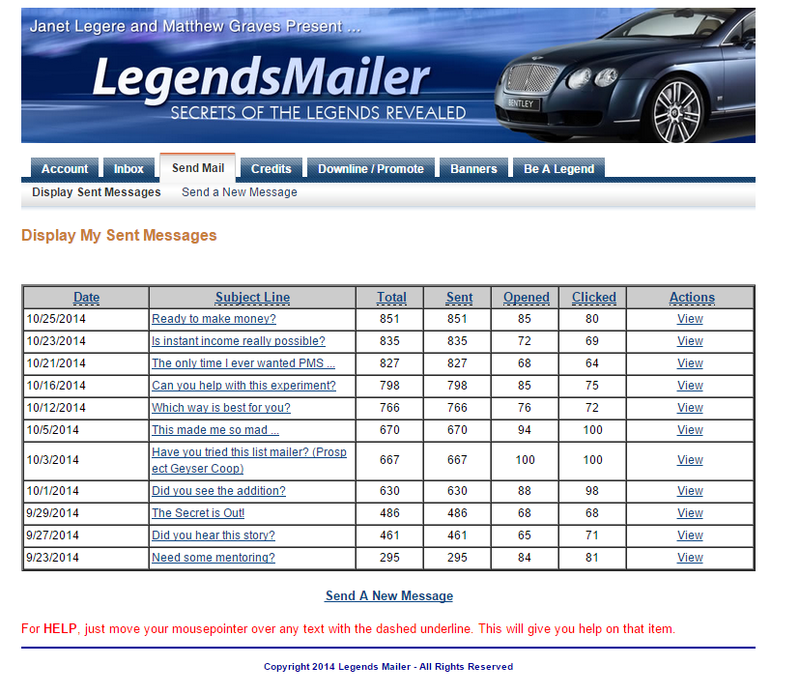 In the members area, you will find access to your Inbox where you can earn credits, the Send Mail feature where you can view your sent emails and send a new ad based on the credits you have. 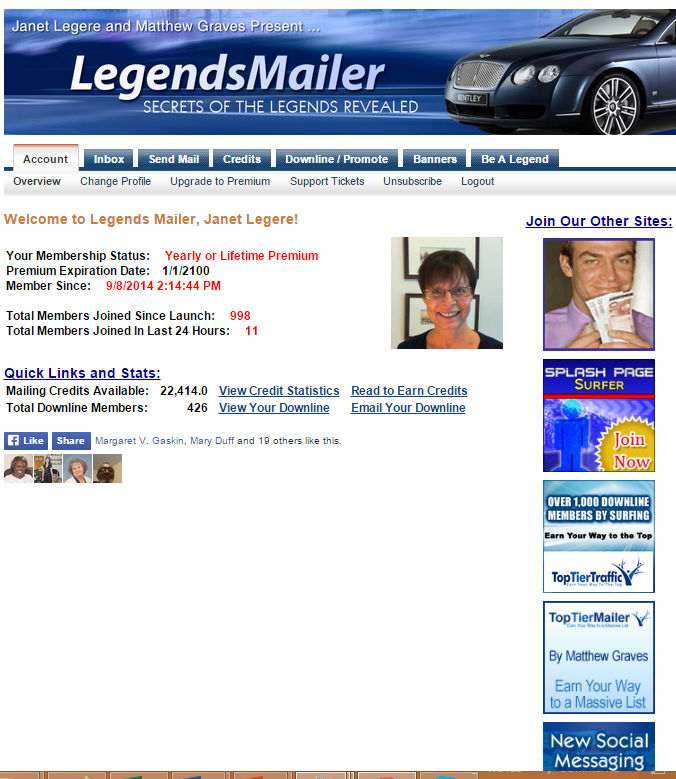 You can view your downline and add your banners if you are an upgraded member. 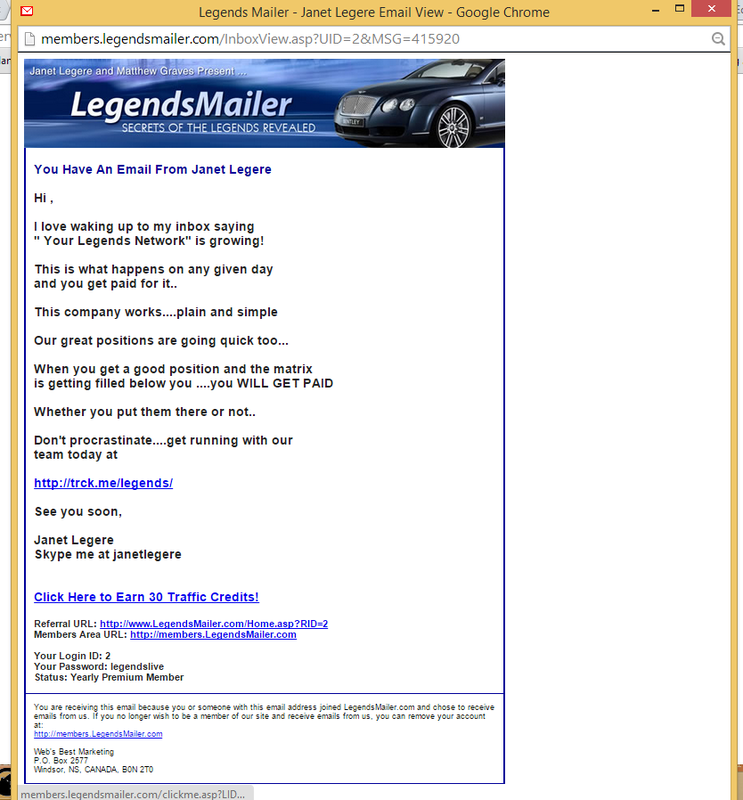 And at the end, you will find our Secret Sauce, Be A Legend! The main page of the members area shows you the credits you have available as well as your membership type. 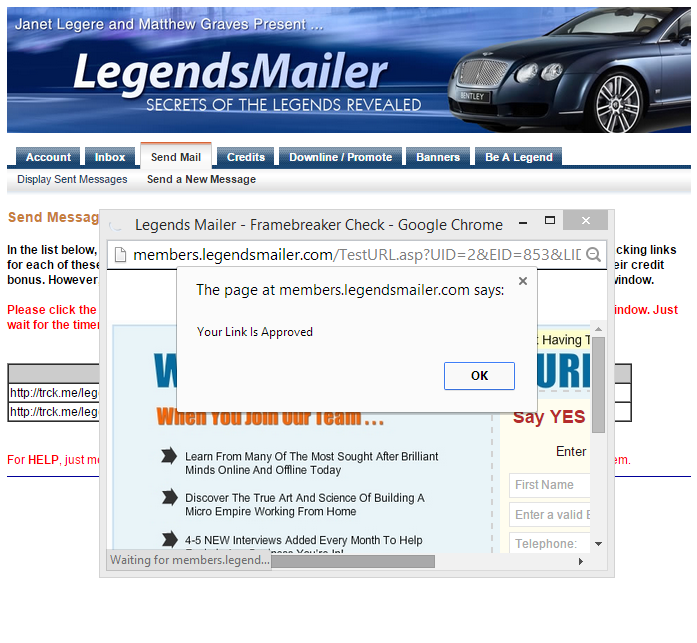 It also indicates your downline which you can view separately. 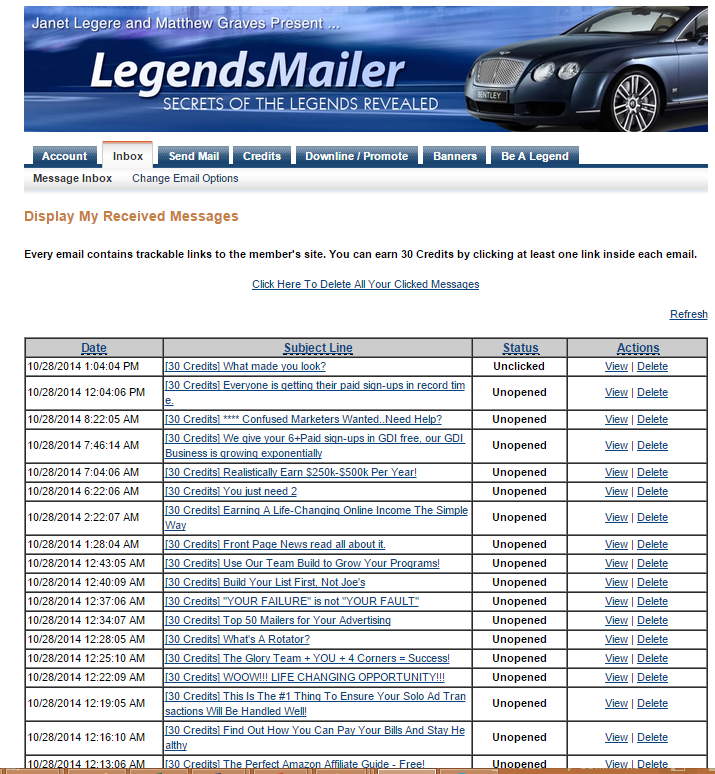 The inbox is where you will find emails that you can click to earn credits. 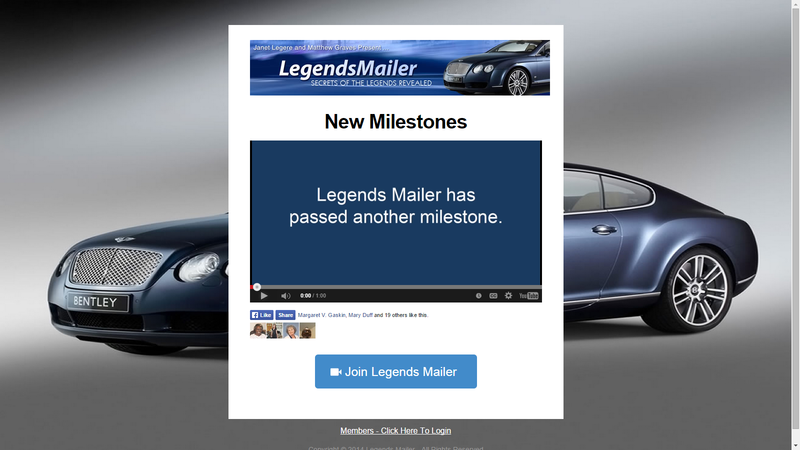 As you earn credits, you can send your email ad to the members of Legends Mailer. 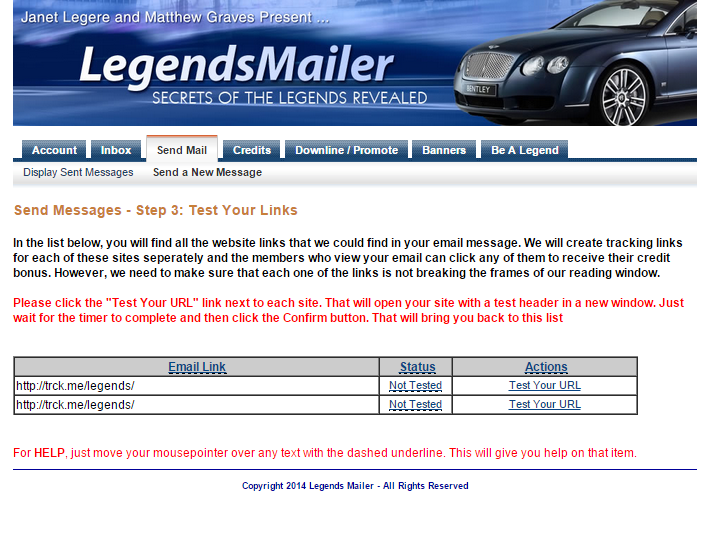 To earn credits, click the View link to the right of the email. 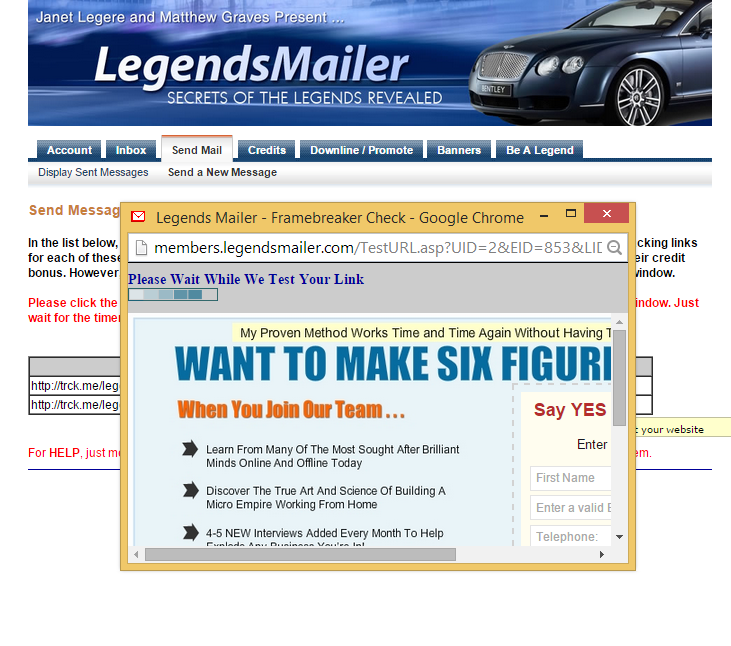 You will click the link that says Click Here to Earn 30 Traffic Credits! 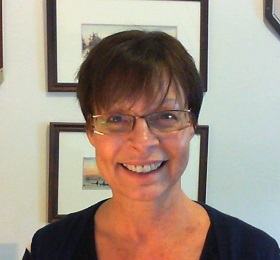 This will open the members website for you to view and earn credits. 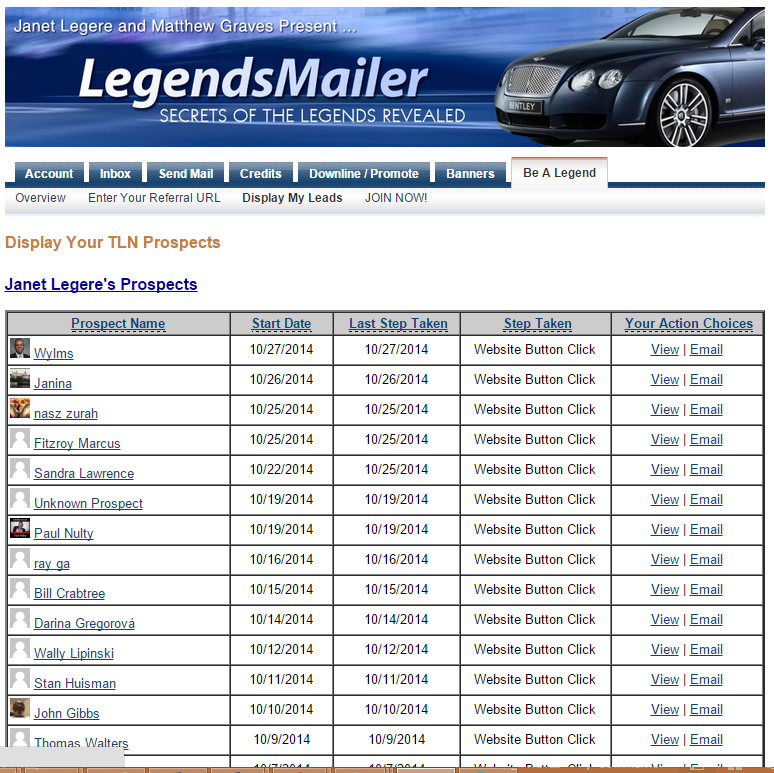 You will earn 30 credits for each email that you click and view. As you click for credits, the system shows the email as “clicked”. 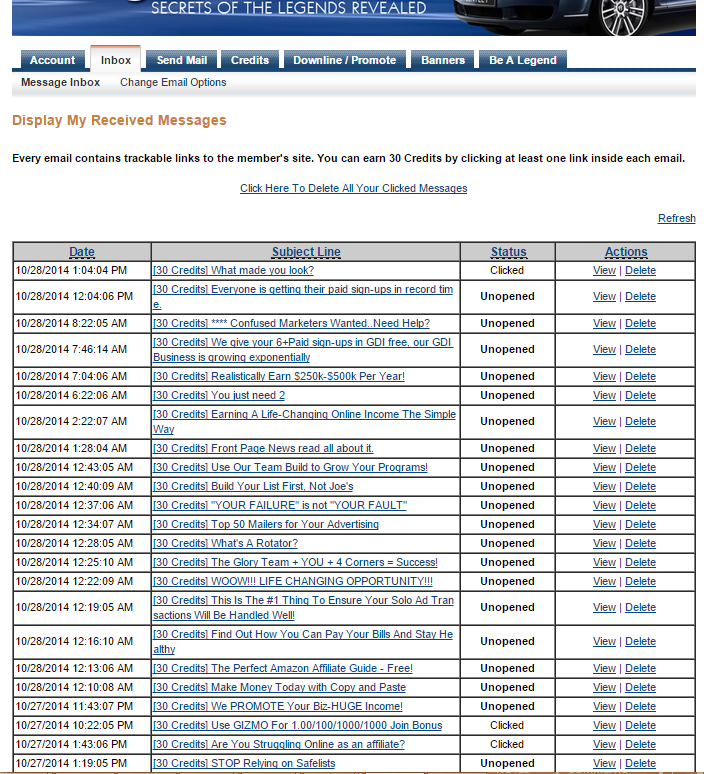 You will see new emails in your back office daily. Once you have earned enough credits, you will use the mailer to reach the other members who will click your link to earn credits. Now you will choose a date. You can choose today’s date or set your ad up to send in the future. Once you select your date, you need to setup your ad. Click on Goto Step 2 at the bottom of the page. The system will pop up your website and ask you to wait while it tests. 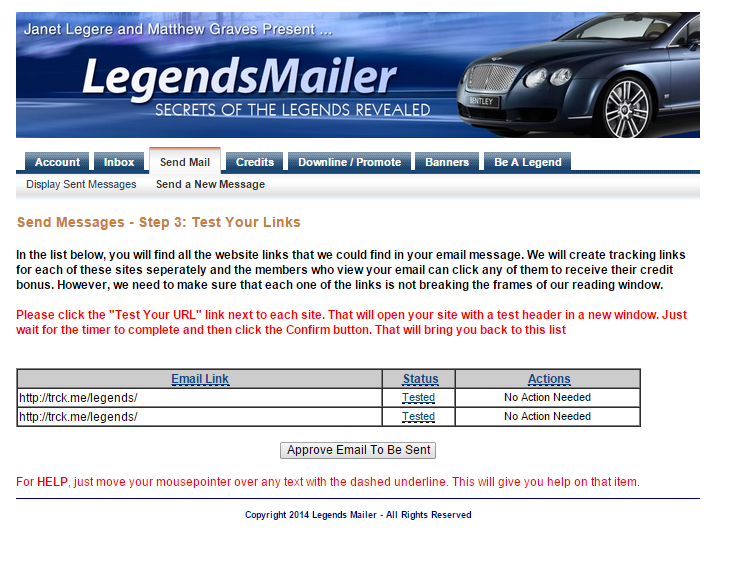 Once all your URLs are tested, you will be able to send your ad, click on Approve Email to be Sent. 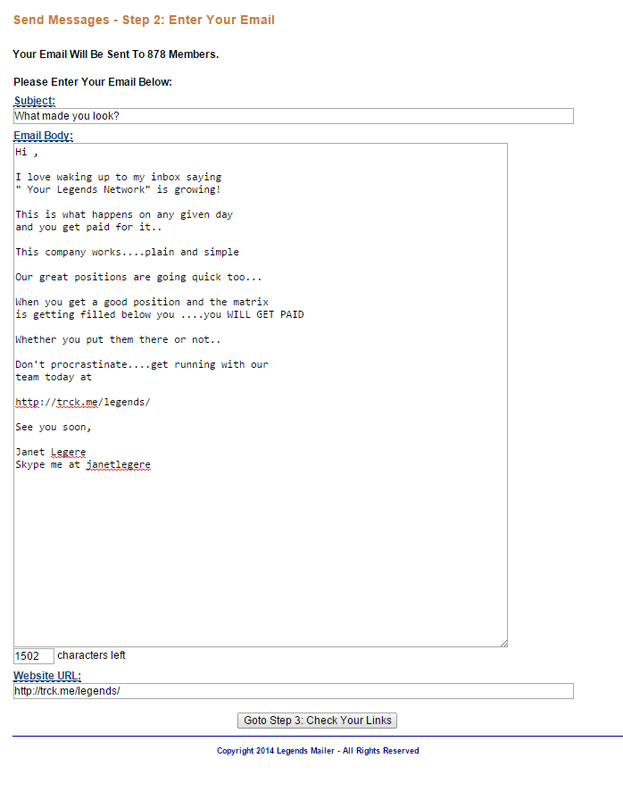 You can view your emails and stats under Display Sent Messages. 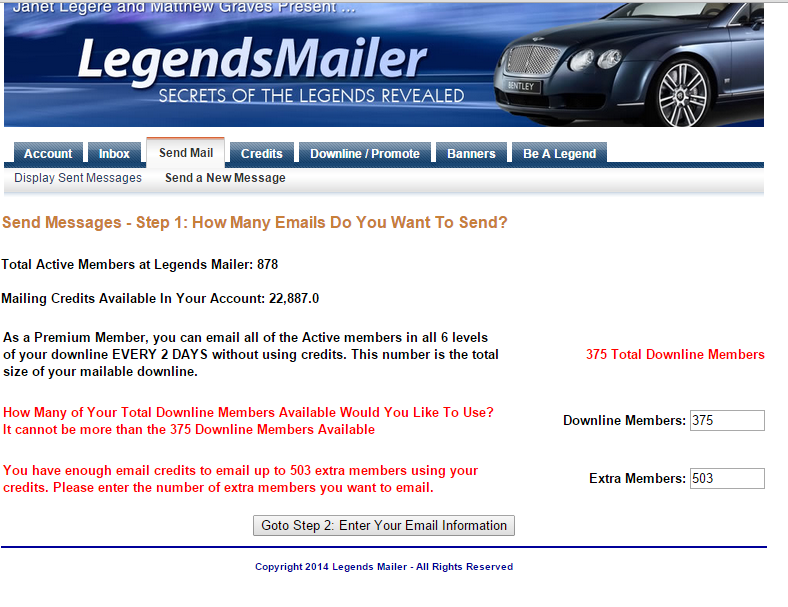 Now we will get into the fun part of Legends Mailer, the Lead system for the Legends Network! Click on Be A Legend to check out this unique system that is JUST coming to life. Click the banner below to join today! 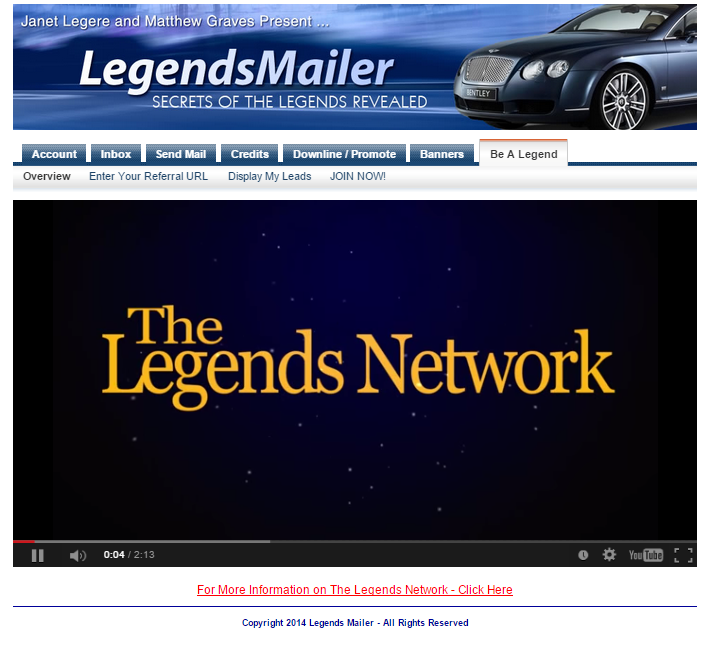 Whether you are with The Legends Network or not, you can benefit from the system and get your business in front of a growing list of fresh eyes!